Accepta 4902 is a high performance; sulphur based heavy metal precipitant scientifically formulated for the treatment, precipitation and subsequent removal of heavy metals from wastewater and effluent streams. Accepta 4902 exhibits a fairly high charge and very high molecular weight an can be used in conjunction with traditional chemical treatments to reduce the levels of heavy-metals in wastewater and effluent streams. Accepta 4902 is an environmentally friendly chelating agent with superior flocculating capabilities. Accepta 4902 comprises a water-based solution, available ready-to-use without prior dissolution or expensive make-up equipment. The versatile molecular architecture of Accepta 4902 allows the formation of flocs adapted to any plant design. Carry-over of flocs in overflows that would normally reintroduce heavy-metals back into the treated water are reduced and suppressed by the addition of flocculants and/or coagulants. 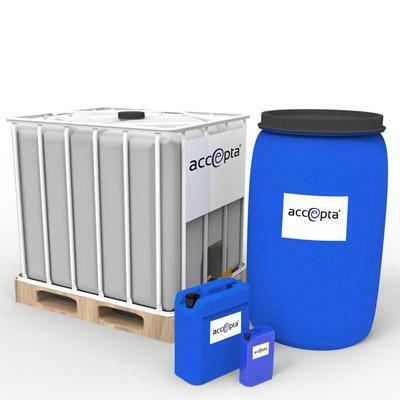 The large floc size that can be achieved using Accepta 4902 also ensures rapid settling and easy de-watering of the sludge. Coagulant / flocculant usage rates can be reduced, and sometimes eliminated when the correct product grade is used. The formation of a dense, compact sludge also helps to minimise disposal costs. Accepta 4902 is effective against a wide range of metals and removes co-existing heavy-metals at the same time. The chelating properties of the dithiocarbamate group allows the precipitation of complex or chelated metals. Chemically stable sludge is generated thereby avoiding any secondary pollution. For a stream without soluble complexes, Accepta 4902 should be added directly to the wastewater at a water pH of between 3 and 10. The dithiocarbamate functionality of the product reacts with the dissociated heavy-metal ion to form an insoluble complex and a floc will form. The dosage of the chelating agent can be determined based on the composition of the water to be treated, the treatment already in place or a jar test. When the pollution level is unknown, please contact Accepta for further technical assistance. If necessary, a coagulant can be added to increase the size of the floc. To further enhance floc size and settling speed an anionic flocculant is sometimes added. A cationic polymer can also be used in specific cases. To treat complexed heavy-metals in the wastewater please contact us for further technical assistance. Accepta 4902 can effectively be removed from effluent discharges by filtering through activated carbon. This treatment is especially useful when excess product has been used to reduce soluble metals to very low levels.